The Museum is currently closed for the Winter. The Isle of Wight Bus & Coach Museum was established in 1997 and was originally situated in two IoW Council owned buildings on Newport Quay, later this was reduced to one building and a Museum was created opening to the public during the summer, where a collection of vehicles and associated artefacts grew into an impressive display, to show the Island’s transport heritage. Exhibits range from an 1880s Civility Stage Coach, a 1934 Dennis Ace, to more recent vehicles. There are examples of vehicles under restoration, many items of memorabilia, and a vast collection of photographs reflecting the heyday of the Island as a holiday destination. The need to secure a permanent and secure base was satisfied in 2014 with the purchase of the former Southern Vectis depot, located in Park Road, Ryde, Isle of Wight. This now houses and displays the Museum’s entire collection of buses and coaches which once ran on the Island. Whilst not strictly ‘Art Deco’ Ryde Depot is absolutely original, in every respect, being designed as a bus garage and used as such until 2011. The building itself is of particular interest, being one of only two former bus garages now surviving on the Island. Built in 1937-8 on Southern Railway land, it is typical of a bus garage of the Tilling era to the design of their architect H.J. Starkey. Many were built but few now survive, following ownership changes in the bus industry. Considerable work was required to adapt the former depot to the role of a Museum for opening to the public at the start of the 2015 season. The Bus Museum is run by an enthusiastic group of volunteers and new members are always welcome. We are a working museum with restored vehicles operating on special occasions such as bus rallies, carnival events and special operating days, which includes our twice yearly running days where we transport our visitors back to a bygone age. However, as we do not have an operator’s licence or appropriate vehicle insurance, we are unable to provide vehicles for hire. This means we are unable to hire vehicles for weddings. For details of how to get to the Museum, Click : How to find the Isle of Wight Bus & Coach Museum. 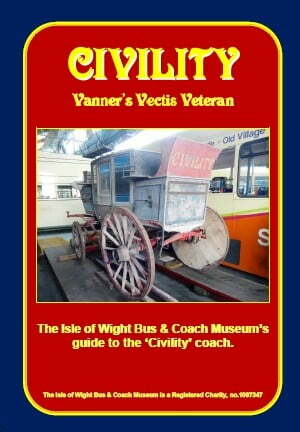 With the arrival of the Civility Stage Coach we have produced a new booklet available from the Museum Shop priced at £4.50. All donations go towards maintaining the collection and improving the display and premises. There is also a shop and tea bar for refreshments. During your visit why not visit our ‘Shanklin Steamer’ tea room? This will offer you a range of hot & cold drinks and snacks, you can enjoy your refreshments aboard our Shanklin Steamer bus. Access to The Isle of Wight Bus & Coach Museum is suitable for wheelchair and pushchair users. Visitors in wheelchairs are welcome; please ask our staff for any special requirements; we will always provide all possible assistance whenever required. Externally, the areas outside of the Museum are concrete, with gentle slopes that continue to the Museum entrance, Gift Shop and Refreshment areas. Full access is available to the main display areas, which again are constructed from concrete and are predominantly level, with gentle slopes and ramps. We welcome your pet dog to our Museum, however, we kindly request that all dogs are kept on a lead throughout your visit and are kept off of the vehicles.